What makes a good hotel great? And a great hotel exceptional? Emily Hourican spends a night at The Dorchester to find out. 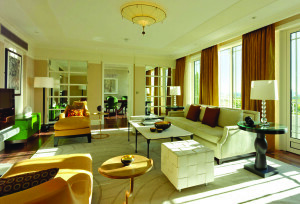 The Dorchester – one of the finest hotels in the world – is very clearly so from the moment of arrival. The bustle out front includes a group of porters and doormen, all engaged in smoothing the transition of guests from hotel to street and vice versa, a number of extraordinarily fancy cars, including a couple of Maseratis, a Bentley and a Ferrari, and a general air of goodwill and focussed activity. Inside, the reception desks are equally busy, but with the controlled, good- humoured busyness that comes with staff perfectly trained to their function, who enjoy their jobs and feel their interaction with guests is valued. It’s not hard to spot these things, if you know what to look for, but it is impossible to fake them. 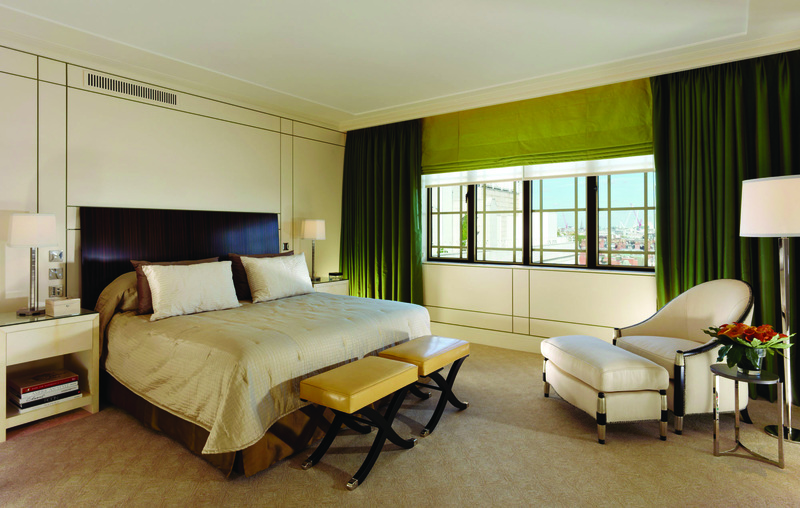 From first sight then, The Dorchester is both a high-functioning and impeccably managed hotel. Much of this must be down to hotel manager John Scanlon. Originally from Listowel, Co Kerry, John is a graduate of Shannon College, and his very engaging story of ending up there goes that, the idea was more his father’s than his. In fact, he wasn’t hugely keen and had been planning how to tell his father that he had different ideas. Then he crashed the family car. Not badly, but badly enough to feel he needed to off-set that news by accepting the place offered to him by Shannon. And so, fate lent a hand, and John trained in an industry he soon realised was perfect for him. Before joining The Dorchester, where he was director of revenue before becoming general manager, John worked at the Lanesborough, starting as night manager and eventually becoming managing director. “Almost 30 years ago, while working at the Cumberland, I used to walk past The Dorchester, because I was saving bus fare, and I would think ‘I’ll never be able to go in there...’” John said at the National Hospitality Conference in November. And that sense of wonder and appreciation for the history and brand value of The Dorchester is very apparent in the running of the hotel. Here is somewhere that has never lost sight of its own place within the culture of the city. And that place is pretty unique. Princess Elizabeth, now Queen, attended a dinner party at The Dorchester the day before her engagement was announced on 10th July 1947, and it was here that Prince Philip celebrated his stag night on the eve of his wedding. During the Second World War, several members of the government as well as service chiefs moved into The Dorchester on a semi-permanent basis. General Eisenhower, then occupied with the planning of the Normandy invasion, set up headquarters in the hotel in 1944. Novelist Somerset Maugham was a frequent guest, as were poet Cecil Day Lewis and the painter Sir Alfred Munnings. Jackie Collins, Elizabeth Taylor, Sir Ralph Richardson and Alfred Hitchcock (who, incidentally, viewed the hotel as ideal for a murder given the scope for burying bodies in Hyde Park across Park Lane), all came and went regularly. For the modern visitor, the presence of such historic glory is to be felt in the general opulence of the surroundings, the consistent charm of the service, and the gentle weight of celebrity that lies discreetly across the hotel. In fact, I’m pretty sure I saw Rod Stewart the night I was there, although politeness, alas, prevented me from twisting around in my seat to the extent I would have needed to be certain. The public areas downstairs are plush and glamorous, from the Eastern dash of China Tang, to the far more formal, three-Michelin- star Alain Ducasse at The Dorchester, the newly-reopened Grill at The Dorchester, presided over by Ducasse protégé Christophe Marleix, and of course The Dorchester Bar, full almost to bursting on the Saturday afternoon I visited. Through it all, literally, is the Promenade, an institution among Londoners, and the place to go for afternoon tea and live piano music. Upstairs – and I can testify to the fact that there are few pleasures as certain as retiring upstairs to a Dorchester room (better still, a suite) after enjoying the relaxed hustle and bustle of the public areas – the first thing one notices is the excellent sound-proofing. The feeling of total privacy and seclusion once that bedroom door is shut, is remarkable. Next, the depth of the bath – deepest in London they say – followed by the supreme comfort of the bed. There is no surer way to feel like a movie star – of the old, Golden Age of Hollywood variety – than this. The ratio of three staff members to every bedroom, along with the undoubted quality of training, means that service is invariably, seamlessly, impeccable. 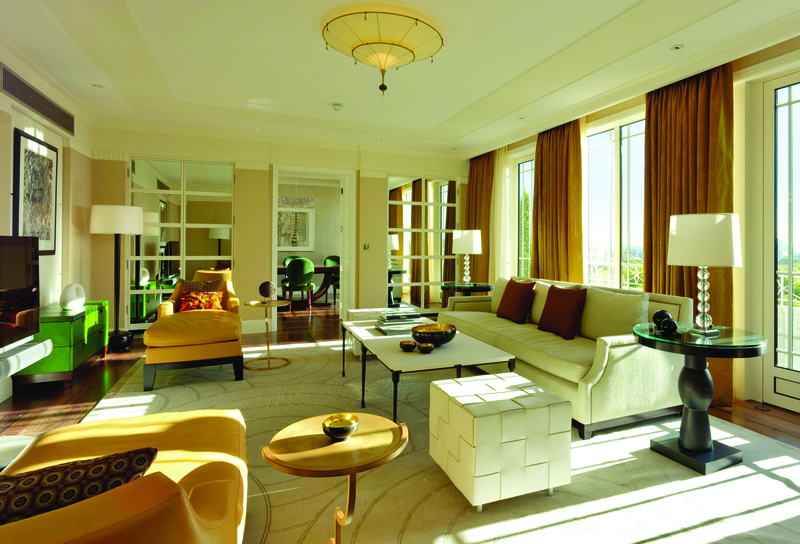 The Dorchester experience is entirely in keeping with its reputation and brand – something exquisite and precious. Despite the weight of history and expectation, there is no stuffiness here, just exemplary attention to detail and willingness to assist. And in this, I think, I can detect the faint, unmistakable hint of Irishness that John Scanlon has brought with him, all the way from Listowel.